They've been more smitten than ever after secretly rekindling their romance over the summer. 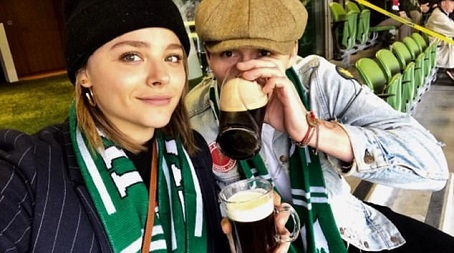 And Brooklyn Beckham, 18, posted a selfie with his girlfriend Chloe Moretz, 20, on Monday - the first since the pair reignited their flame. The couples' display of affection comes after Brooklyn was spotted strolling hand-in-hand with Chloe in Dublin, Ireland over the weekend, visiting the actress on set while she shoots her new film The Widow. The photo depicts the young lovebirds sipping pints of Guinness while wearing the Irish colours, while watching the highly-anticipated Leinster Vs Munster rugby match that was on over the weekend. Brooklyn captioned the sweet photo: 'Dublin. You were amazing.' Chloe also posted one on her page.